The Australia’s Biggest Morning Tea event at Paradise Point has long boasted at being one of the biggest on the Gold Coast. It has become so popular that this year it has relocated to Runaway Bay Community Centre to cater for its new HIGH TEA format. Over the years it has been running, this event has raised about $100,000 for Cancer Council Queensland’s vital work in cancer prevention, research and support services. Simply gather together your friends, family and colleagues, and book a table at the event voted one of the most successful Australia’s Biggest Morning Teas on the Gold Coast and tuck into some delicious and healthy morning tea treats. There couldn’t be an easier way to help make a difference. 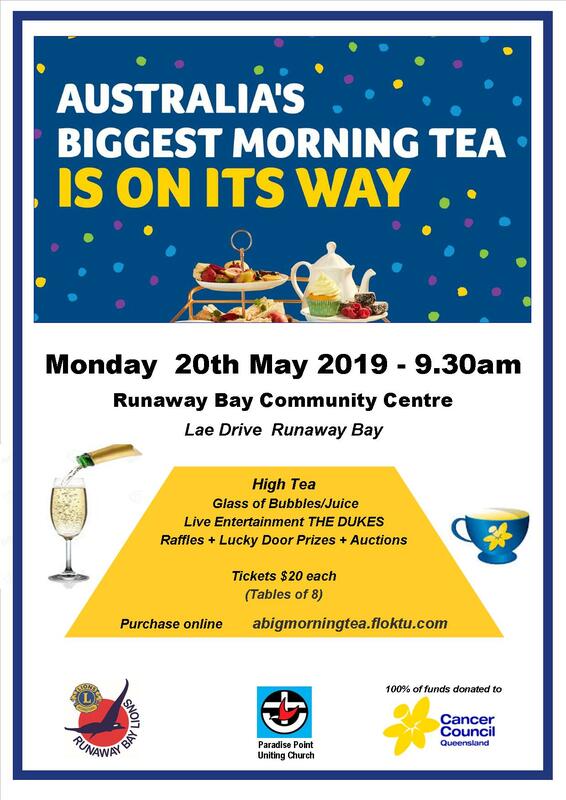 The Australia’s Biggest Morning “High” Tea is a wonderful annual event hosted jointly by the Paradise Point Uniting Church and the Runaway Bay Lions Club. The event will be held in the Runaway Bay Community Centre from 9.30am on Monday, 20th May. As well as a yummy morning “HIGH” tea, you will also be in the draw for numerous lucky door prizes. But wait, there’s more, Live Band entertainment by the very popular “The Dukes” and of course you will be able to participate in Mini Auctions where you can snaffle a bargain. All this, and more for a minimum donation of $20 per person. Cancer Council Queensland CEO Chris McMillan thanked the Paradise Point Community Church and Runaway Bay Lions Club members for their support. “Taking part in Australia’s Biggest Morning Tea is an easy and fun way for friends, families and communities to unite together and make a difference in their local community,” Ms McMillan said. “One Queenslander is diagnosed with cancer every 20 minutes – the length of an average morning tea break. Runaway Bay is coastal suburb located on the northern reaches of the Gold Coast, Queensland, Australia. The development of Runaway Bay started in 1972 to transform the subdivision into a residential and boating area. The name "Runaway Bay" was coined to promote the area as a tranquil retreat. Runaway Bay Lions Club strives to serve the suburbs of Runaway Bay, Hollywell, Paradise Point, Coombabah, Biggera Waters, Anglers Paradise, Labrador, Arundel and surrounding areas. Ordinary people doing extraordinary things - supporting a diverse range National programs in Health, Youth and Disabled. Come along, your most welcome. Be a part of the change. Join the Runaway Bay Lions Club.